Purchased from Partridge Fine Arts, Ltd., London. This pair of boldly-carved side tables, which would have been called 'Roman tables' in early 18th Century pattern books, were designed in the antique manner as sideboard tables for a stone banqueting hall or saloon. The iconography of the design was intended to recall ancient poetry from sources such as Ovid's metamorphoses or Loves of the Gods, and as such the spread-winged eagle would recall its role in bearing away the youthful Ganymede to serve as Jupiter's cup bearer at the banquet of the Gods. The wave scrolled ribbon motif which decorates the frieze, named after Vitruvius, author of the Roman architectural treatise, is appropriate for a buffet-table intended to support silver water fountains. The Odyssey, recounting the history of Rome's foundation after the Trojan wars. Kent used scenes from The Odyssey in his ceiling of Roman mosaic to decorate King George I's aparment or gallery at Kensington Palace. 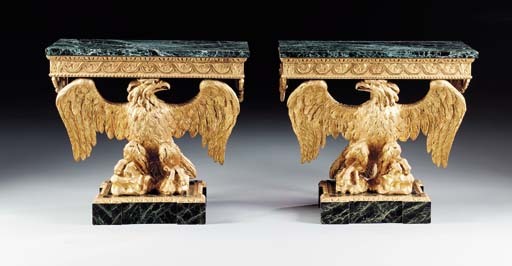 The C-scroll-carved bracket sides on this pair of consoles is very similar to that found on a related pair of eagle consoles supplied to Dudley North, Esq. for Glenham Hall, Suffolk and sold anonymously, Christie's London, 12 November 1998, lot 80.